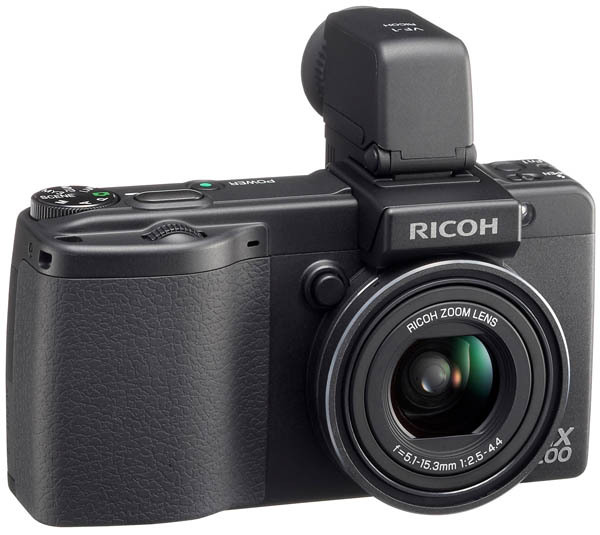 The Ricoh GX200 is a high-end, 24 mm super-wide-angle, digital compact with a high resolution 12 megapixel CCD. The GX 200 succeeds the award winning Caplio GX100 compact digital camera which was introduced in April 2007. The GX 200 features increased resolution via its 12 megapixel CCD, better noise reduction with the addition of the new Smooth Imaging Engine III, a larger 2.7-inch, 460,000 pixel HVGA LCD screen, ISO 64 to 1600, 5 shot continuous RAW mode and an electronic level function for horizontal and vertical shooting. The GX200 inherits the popular features of the GX100 such as a 24 to 72 mm wide-angle optical zoom lens, 25 mm thin pocketable compact body, and removable tilting electronic viewfinder (optional accessory). Tokyo, Japan June, 24, 2008 Ricoh Co., Ltd. (president and CEO: Shiro Kondo) has announced today the development and release of the GX200. The GX200 is able to reproduce high quality images from edge-to-edge with low noise and natural gradation. 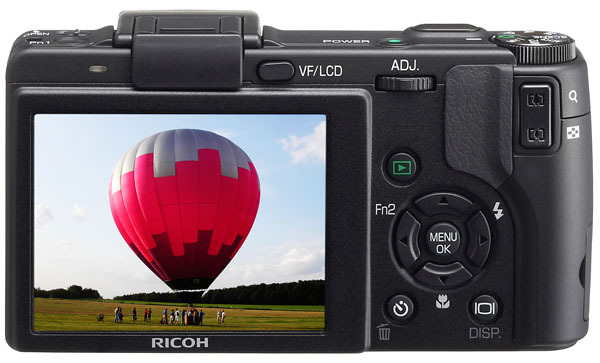 This camera succeeds the award winning Caplio GX100 compact digital camera introduced in April 2007. The GX200 inherits the popular features of the GX100 such as a 24 to 72 mm (35 mm ?lm equivalent focal length) high-performance wide-angle optical zoom lens on a 25 mm thin pocketable compact body, a wide variety of manual shooting functions, and a removable tilting electronic view?nder. The new GX200 achieves increased resolution via its 12 megapixel CCD and dramatic noise reduction with the addition of the new image processing engine Smooth Imaging Engine III. Already a popular part of the Caplio GX100, the high-resolution wide-angle lens unit has been further con?gured to enable picture taking at an even higher resolution. With a large wide-viewing angle 2.7-inch 460,000 dots HVGA LCD and an electronic level function, for horizontal and vertical shooting, the GX200 contains extensive shooting functions to enable camera lovers to enjoy and create stunning photographs. This model comes in two package types with different accessories. The GX200 package contains: rechargeable lithium ion battery, battery charger, AV cable, USB cable, CD-ROM, strap, and lens cap. The GX200 VF KIT package contains all the above accessories plus the electronic viewfinder. *The lens focal lengths used in this document are the equivalent focal length for a 35 mm camera. 1. Greater image quality through use of a 12 megapixel CCD, a new image processing engine and continuous RAW mode capture. • An effective 12 megapixel high-performance 1/1.7-inch CCD has been newly installed, with each pixel comes increased resolution. • The adoption of a new image processing engine Smooth Imaging Engine III allows for greater control over the noise reduction process by the photographer without sacri?cing resolution or saturation. • High image quality combined with a lens with greater backlight capability*. • *This is the 24 to 72 mm equivalent wide-angle zoom lens mounted on the previous model (Caplio GX100). It features a generous configuration of 11 elements in 7 groups, including superior aspheric surface lenses and high-refractive-index, low-dispersion lenses. This optimal con?guration restricts distortion, chromatic aberration, and light falloff at edges for wide-angle operation while delivering aperture light settings from F2.5 (wide) to F4.4 (tele-photo). In addition, ghosting has been further reduced through the improvements made to the lens unit. 2. Large, high-resolution 2.7-inch, 460,000-dots HVGA LCD. • The new 2.7-inch, 460,000-dots high-resolution LCD has a wide viewing angle and high contrast for distinct, easy viewing even outdoors. When thumbnail images are displayed, even the small 1/20 size images are clearly reproduced. • If the level setting is set on, when the camera is level, the level indicator becomes green in the picture display. Being able to check whether the image is level while looking at the display can be useful for keeping the camera level when composing pictures of landscapes, buildings, and other scenes where the horizon is visible. • It is possible to check whether the camera is level using the level sound setting. • The electronic level can also be utilized while using the viewfinnder. 4. Extensive shooting functions and high operability. • Expanding buffer memory has made continuous shooting of up to ?ve images possible in RAW mode, and it is also now possible to use the bracketing function to automatically change exposure settings when shooting in RAW mode. Other expanded RAW shooting capabilities include the ability to shoot 1:1 aspect ratio (vertical/horizontal ratio) format photography in RAW mode. • There are now one-push mode change function buttons both on the top surface and as one of the rear-surface cross keys. These buttons can be used for customized settings to, for example, to switch from JPEG to RAW or from colour to B&W. You can switch quickly to your preferred shooting mode when confronted with a sudden photo opportunity. • The AF target shift function, which before could only be used in macro shooting, is now also available in normal shooting. Without moving the camera, it is possible to shift the target for AF or AE or both. • An auto rotate function makes it easier to view images on the picture display. • Even when shooting in high-contrast situations, the camera can use an auto level correction function to achieve an appropriate level of brightness while reducing areas that are overly bright or dark. • There is a distortion correction function (on/off selection possible) to automatically correct image distortion during shooting also usable with 19 mm conversion lens. • When in aperture priority mode, an auto aperture shift function will automatically adjust the aperture setting to prevent overexposure. 5. Enhanced image editing functions enable images to be manipulated in the camera. (1) Image colour tone correction (white balance compensation). • By adjusting green, magenta, blue, and amber tones, still image colour tone can be corrected, with the corrected image being recorded in the camera. (2) Image brightness and contrast correction (level compensation). • Still image brightness and contrast can be corrected with either auto or manual modes, with the corrected image being recorded in the camera. With manual correction, the image is corrected by adjusting the histogram. (3) Wide range of creative monochrome possibilities. • Colour, colour density, contrast, and sharpness can each be de?ned on a ?ve-level scale. • Sepia, red, green, blue, and purple colour selections are possible. 6. Additional options further expand possibilities for camera use. • Lens cap (LC-1) opens and closes automatically in sync with lens movement. • 135 mm equivalent tele conversion lens (TC-1) with built-in hood. Filter attachment possible. When the tele conversion lens is attached, vignetting will occur when the zoom is not set to full telephoto. *The above two options can also be used on the Caplio GX100. 7. Removable electronic view?nder can be attached. • A removable and tiltable electronic view?nder can be attached (included in GX200 VF KIT). • The ?eld of view provides 100% coverage without parallax and can display the same information as on the LCD picture display. • It is convenient for shooting in bright outdoor environments and enables shooting to be done in a conventional ?lm camera style. *1 The VF-1 LCD view ?nder is included in „GX200 VF KIT“. wide conversion lens or the tele conversion lens is attached; the internal ?ash cannot be used because vignetting may occur. *3 The ST-1 neck strap for the GX/GX8 cannot be used. GX200 Standard is available at £349.99. Still image: 180, 120, 60, 30, 15, 8, 4, 2, 1 to 1/2000 sec. / Movie: 1/30 – 1/2000 sec. * 1: The shutter speed upper and lower limits vary depending on the shooting mode and ?ash mode. * 2: The picture quality mode that can be set varies depending on the image size. time. The DNG ?le format is a RAW image ?le format and is the standard format of Adobe Systems. *4: The estimated number of pictures that can be recorded or the estimated recording time. *5: The maximum movie length that can be recorded at one time is either 90 minutes or 4 GB. *7: When the ?ash is set to [Flash Off]. *8: Mass storage mode is supported by Windows Me, 2000, XP, Vista, Mac OS9.0-9.2.2, and Mac SX10.1.2-10.5.2. *9: The number of remaining shots is based on the CIPA standard and may vary depending on usage conditions. *10: Using Panasonic AAA alkaline batteries. * Windows is a registered trademark or trademark of Microsoft Corporation in the U.S.A. and other countries. * Mac OS is a registered trademark of Apple Inc. in the U.S.A. and other countries. This entry was posted in Digital Cameras, Ricoh and tagged Richo GX 200, Ricoh on June 26, 2008 by jonathanb.